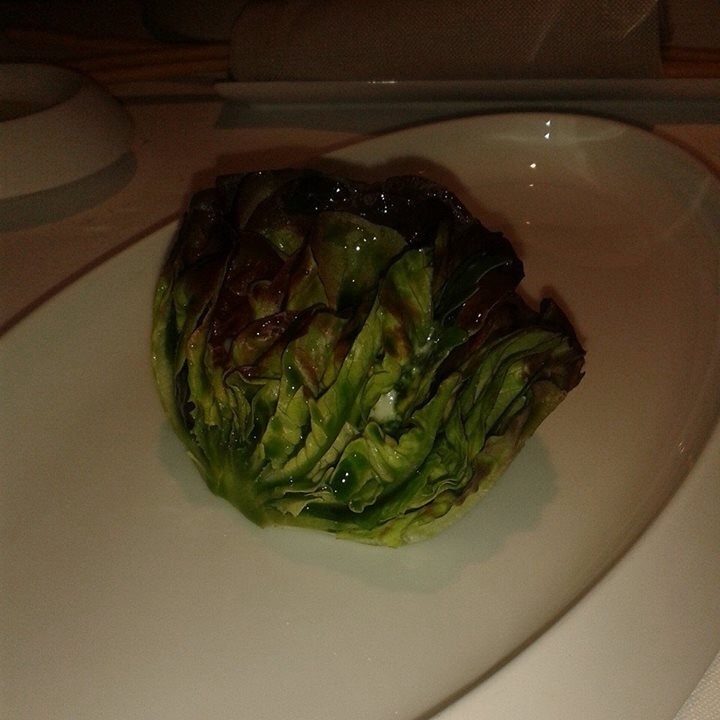 Billed as the culinary highlight of our trip, Osteria Francescana did not disappoint. An aperitif perhaps? Why not? A glass of 2005 Spumante… Nothing like any similar named beverage tried before. The trifold menus… Large enough to take shelter behind…. Offering two pages of a la carte options, plus two degustation choices, one the experimental menu (undeclared – just take what the chef happens to be playing with today); the other (Peter’s choice for us) the traditional tastes of the region, in many parts… Let’s see if I remember them all…. First, and before the actual menu starts, a few things to get your appetite going… Home made sour dough bread, with olive oil from their own press; a pink piped pile of mortadella (meat mousse, I can hear Howard saying), with some crisp bread and a touch of truffle oil on the side (dubbed “memory of a mortadella sandwich”) to be followed by a Parmesan wafer topped with lard and truffle shavings… Yum! And so to the actual menu… Now accompanied by house made grissini, and a basket of savoury whole meal mini-croissants and tiny white sourdough rolls. 1. 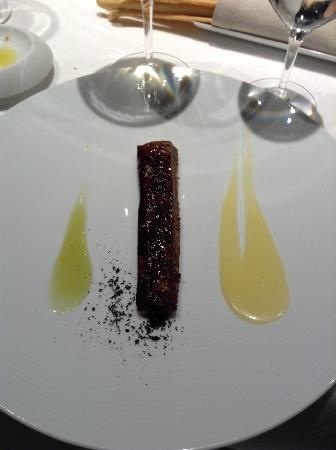 Eel swimming up the Po River… A small slab of eel, perfectly cooked in the must of aged balsamic, with a pale swipe of polenta down one side of the plate, representing the corn fields to the south and a bright green swipe of extremely tart apple something on the other side, the apples of the north. Peter reminds me that the evening before a local British expat, albeit clearly impressed by our reason for being in Modena, rather cynically told us that the chef here only became famous when he married an American marketer. Clearly she’s read the book on the value of story telling. But the food is delicious, and soon gone! As is the artisan beer that accompanies it as the “wine” match… A working men’s match, Peter called it. Eel and beer. 2. My least favourite – something about the tastes of Modena. A rusk like biscuit topped with extremely rich sausagey meat of some sort, covered with an even more rich zabaglione made with the local sparkling red wine, with splashes of balsamic vinegar… Did I mention Modena is the home of balsamic vinegar? In fact, we may well go on a tasting with a difference tomorrow. Meanwhile, this course was honestly too rich for me, though thankfully off set by the cuttingly dry white wine. At this point, Peter stops commenting on the teeny tiny portions, we’re definitely not going to need a Big Mac on the way home! The solo diner at the next table strikes up a conversation with us… He’s a sommelier from a restaurant in Colorado, on. Business trip to Italy to learn more about their wine. Quite knowledgeable we discover, and also a part time cyclist. We maintain polite occasional conversation…. He’s having the experimental menu, and is photographic all the wine matches. 3. Caesar salad – described by the waiter as “our take on the traditional dish, with 25 ingredients”… Most of these, it should be said, schmoooshed up in the dressing that intersperses the leaves along with crispy shards of bacon and Parmesan crisps. Served, after the richness of the previous dish, with a rather strange drink… Aquavit, just a splash, diluted with lots of water. Waiter says it is to clean the palate. Peter unimpressed says it’s like drinking canal water – I hope he didn’t actually taste the canal water in Venice! I don’t mind it, it certainly clears the palate, as promised. 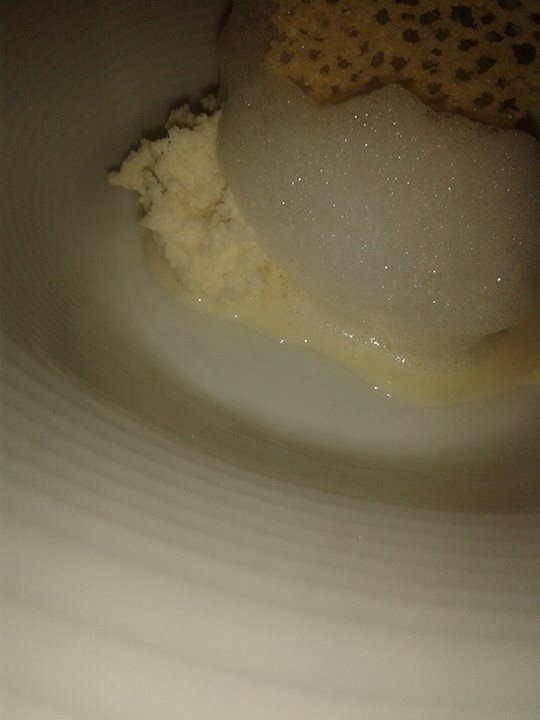 One of the real highlights – different renditions of Parmesan cheese, ranging in age from 3 to 50 months, the melted “soup”, the mousse, the foam, the crisp, all different bu fantastically complementary. Definitely worth the trip! 5. Tagliatelle with meat ragu – a swirled pile of beautiful pasta, with a chopped (not ground!) meat sauce… Delicious as a meal on its own… By now I’m feeling I might need a little jog around the block! But wait, there’s more…. 6. Veal not flame grilled… Actually a wonderfully rare slab of beef fillet, encrusted with ash and artfully placed amidst a modern-art-like swirling picture of different coloured sauces… With finally a red wine match. We are slowly, very slowly, learning just a little about the dozens of unfamiliar grape varieties that make wine here in Italy. Today we seem to have had more than a few from the south – Sicily and Sardinia – but so far my favourites are definitely the Nebbiolo from our first stop (none of that on today’s menu matchings) and this Nero d’Avolo similar to the one we drank last night, and are now seeing featured to match our beef. 7. Surely dessert? The bread sticks and basket are removed, the tablecloth expertly swept of crumbs. 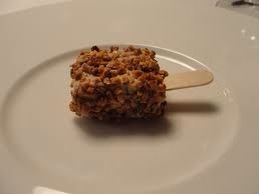 A small Popsicle on a stick arrives… But no, this is the famous foie gras popsicle, dipped in 50 year old balsamic and crusted with chopped almonds. Wow! 8. Finally, a small, but perfectly formed dessert. 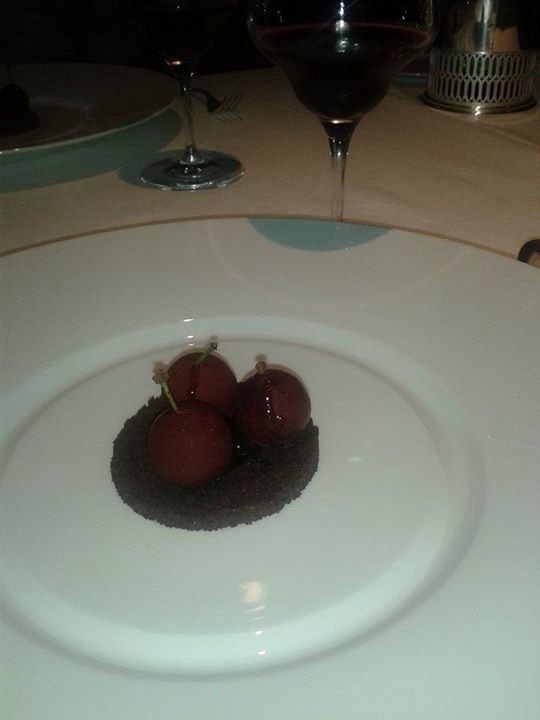 Three plump red cherries on a bed of chocolate and coffee crumble… Not real cherries, says our waiter… Great chocolate globes, filled with coffee and cherry juice – don’t eat the stick! he cautions, and use your spoon. They explode in the mouth, a fantastic accompaniment to the slightly weird final “wine” match of sour cherry juice! And so to coffee.. Of course! With a selection of bite size chocolates and sweet treats that we somehow found place for! And so, three hours later, we waddled ‘home’, heavier of body and much much lighter of wallet… Our American dining companion stands and introduces himself as we are leaving, Austin is my name (I think, but not from Texas). He invites us to dine at his restaurant in Colorado if we’re even up that way. I invite him to come try some NZ wines… he knows a few, Waiheke Ironclad on the winelist at his place! In a throwback to the days of olde, in this Italian restaurant, they still have a lady’s menu, with no prices! This despite all communications relating to the booking having been done by ME, the emails, the phone calls, everything… Peter gets the menu with prices, and of course, the bill at the end! I should not complain (and I don’t)… Just commenting, I say. He says: It’s only right, the way it should be! Everyone in their place! But blow me down, at 8pm Peter was up and off again to find a wee bite for dinner!